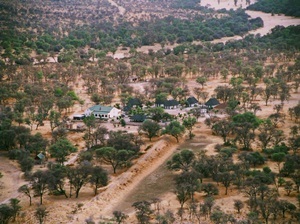 In the middle of Namibia lies the guest farm Okomitundu, covering an area of 18,000 hectares. A holiday at Okomitundu means: sunshine – peace – vast landscapes – red dunes – silvery grass rustling in the wind – blue mountains in the distance – fascinating desert rock formations – wild animals and plants – tropical river banks – warm hospitality – friendly, relaxed people. In short: pure nourishment for the soul! There are eight en suite rooms, each with its own veranda. Paved paths lead through neat rockeries from the main building to the rooms. Meals are served on the veranda, under shady trees or in a cozy dining room. Etusis Lodge is only a 2½ hours drive from Swakopmund or Windhoek and situated in the Etusis Nature Reserve which covers more than 21,000 hectares . The 7 bungalows are placed harmoniously into their surroundings, each for up to 4 persons. There are also 5 luxury tents, for up to two persons, available. There are central restrooms, washing facilities and showers. The tents are far enough from each other to make sure that you will hear nothing but the sound of the African wilderness. There is also a farm house on the Etusis Wildschutzgebiet with optional 1, two, three or 4 bedrooms. Ameib Ranch lies at the edge of the Erongo Mountains. The swimming pool in the garden offers to relax for a while . An attractive camp-site with swimming pool and ablution block is also available. 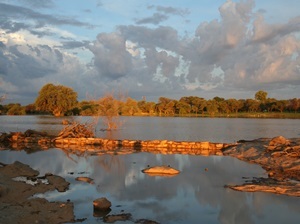 The ranch offers many opportunities for the photographers, friends of the rock art and nature lovers. Ameib, meaning "The Green Face", is also home of Hartman's Zebras, Oryx, Kudu, Springbuk, Klip-Springer, Steenbok, Giraffe, Pavian and many more. 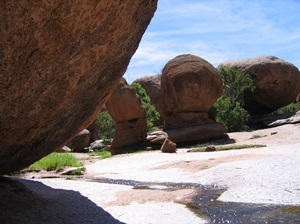 The sculptured rocks at the Bull's Party (Klein Ameib), the Stone Elephant Head will be some of the highlights. The famous Phillip's Cave with the rock painting The White Elephant is another. Guided tours are offered to other rock paintings. The walking trails over the ranch offer game spotting and the observing of indigenous birds as well as the Fauna and Flora. The lodge boast 2 bed Bungalows, Double rooms, Single rooms, 2 bed Cottages. 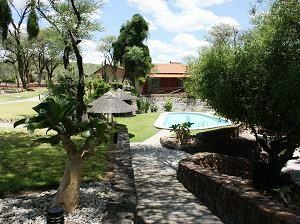 The guest farm is situated 240km, about a 2.5-hours drive , to the northwest of Windhoek. Omaruru , the closest town is 25km away from the farm. The farm buildings, surrounded by acacias, are directly situated at the river. 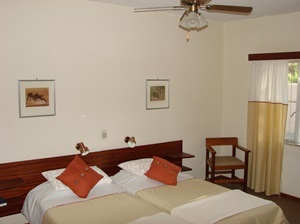 Accommodation is offered in 10 rooms each with its own en-suite bathroom. Thanks to the waterhole close by you can observe game even from your bungalow. In the evenings you can sit there and, while having a glass of rich red wine, enjoy the unique beauty of the African sunsets. The swimming pool offers refreshment and a beautiful view of the landscape. The Erongo Wilderness Lodge is situated in a secluded valley and has 10 tented chalets, built on stilts, set against towering granite formations. Each chalet has its own niche amongst the rocks, ensuring peace, privacy and exclusivity. The lodge invites you to luxuriate in this richness of nature. The luxury Meru tents are pitched under steep thatched roofs for shade, and have netting across all windows and doors, allowing only the breeze to enter. The en-suite bathrooms are built around the existing rocks and trees, naturally. With its own private deck, bush-style mini-bar, and spectacular setting, each chalet is the best way to experience the lush Erongo environment. Atop a separate granite hill, the restaurant and lounge. With a large, central fireplace, comfortable lounge and our ‘mokoro’ bar, this area is as much for unwinding as it is for fine wining and dining. Languid days are spent at the adjacent swimming pool and ‘relaxation’ deck. 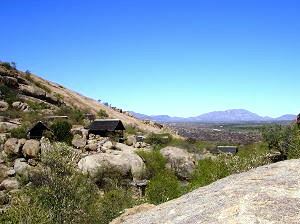 Set afoot massive, scared granite rock boulders, overlooking the magically beautiful range of the Erongo, is Ai Aiba - The rock painting Lodge. The overwhelming panoramic view from the restaurant and bar will be amazing. The crystal clear pool invites you to refresh and dream. 10 thatch-roofed bungalows offer 20 luxurious double rooms with their own terrace, showers and separate WCs. Omaruru Guesthouse is right in the center of the country. Ideal for nature lovers, adventurers, families or individual travelers, Omaruru Guesthouse provides stylish, yet comfortable accommodation. Their 19 rooms are equipped with modern en-suite bathrooms. Omaruru Guesthouse is situated on the banks of the Omaruru River. The big shady trees and the refreshing swimming pool offer space for relaxation and a big verandah provides space for dining . Erindi is situated in the triangle between Okahandja, Otjiwarongo and Omaruru. Old Traders Lodge provides the accommodation at Erindi Private Game Reserve. This impressive lodge comprises the main dining room and viewing deck as well as 35 well appointed suites including 5 deluxe suites. Three of the five deluxe suites face the water hole. The spacious suites include; Comfortable double or twin single beds with crisp linen and warm blankets, remote controlled air-conditioning, en-suite bathroom with bath and shower, in-room safe, in-room study desk, satellite TV, hairdryers, fridges and kettles. Activities are: Game Drives, Arial Game Viewing by Helicopter or Microlite can be pre-booked but depend on whether conditions. 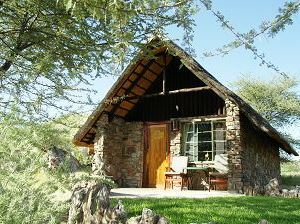 Epako Ranch is a luxurious 11 000 ha safari game lodge near Omaruru. The lodge is located in beautiful mountainous surroundings on the outskirts of the renowned Damaraland . The safari lodge boasts a wide variety of animals and at least 170 species of birds have been identified. Game drives, during which you will most definitely see the rhinos, include visits to Namibian San Paintings and Rock Engravings which are located within our boundaries. 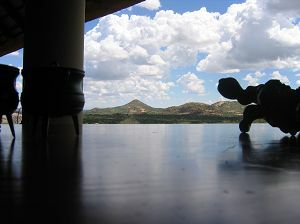 One of the places most favored by guests is the inside and outside dining area which overlooks a waterhole. This drinking spot is frequented throughout the day by many different animals and lit up at night you might meet Oscar, the tame giraffe. Accommodation is of a high standard each room featuring its own terrace, have air-conditioning, a mini-bar, telephone, bathroom en suite and a terrace. Meals are a combination of Namibian and French cuisine. For refreshment and sporting activities the lodge offers a swimming pool and tennis courts.